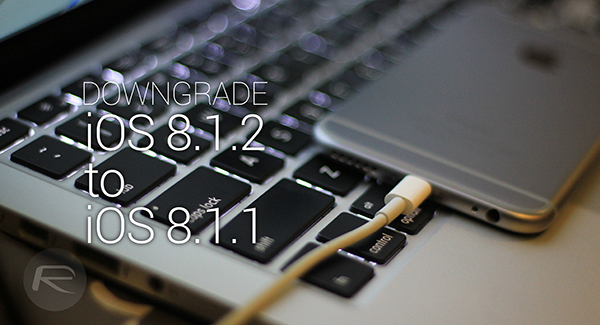 Here’s a complete step-by-step guide on how to downgrade iOS 8.1.2 to iOS 8.1.1 on iPhone, iPad and iPod touch. Complete details can be found right here after the jump. iOS 8.1.2 download is a rather mundane update to say the least, and comes with very minor bug fixes. In fact, even if you do install said update, you won’t even feel the difference between the new and the old. But if for some reason you feel obliged to revert back to iOS 8.1.1, mainly for the purpose of jailbreaking, then you can do so right away, as Apple is still signing the aforementioned firmware for all iOS devices. Step 1: Download iOS 8.1.1 from here for your iPhone, iPad or iPod touch. Make sure you download the correct firmware file otherwise iTunes won’t let you move a muscle. Step 2: Backup your iOS device either using iCloud or locally using iTunes. Step 3: Plug your iOS device to your PC or Mac, launch iTunes, hold down the left SHIFT key on PC (or the OPTION key on Mac) and click on the Restore iPhone button. Select the firmware file you downloaded in Step 1 and let iTunes do its magic. In a few short minutes you’ll be back to iOS 8.1.1, ready to jailbreak your device using TaiG. It is important to note that once Apple stops signing the iOS 8.1.1 firmware, you won’t be able to downgrade back from iOS 8.1.2. So hurry up. Apple might be closing the signing window anytime now. Updating to the latest firmware is always a good idea though, since it comes with new security fixes and enhancements that are meant to keep us safe during our daily usage of our devices. But still, if you feel that a jailbreak is on the top of the list of your priorities then go ahead and downgrade away! For those planning to Jailbreak on iOS 8.1.1 then I highly recommend adding this Cydia Source into Cydia after you jailbreak so you don’t have to manually input all those Cydia Sources manually. This will automatically add all the best Cydia Sources and give you access to all the best Cydia Tweaks, Themes and Apps for FREE with just a push of a button. Follow the steps below. I can’t downgrade anymore. iTunes sat not possible. Also my jailbreak is broken.